In 1956 I ordered my first Mercedes Benz automobile at the factory and took delivery in December of 1957; ivory exterior, red leather interior. 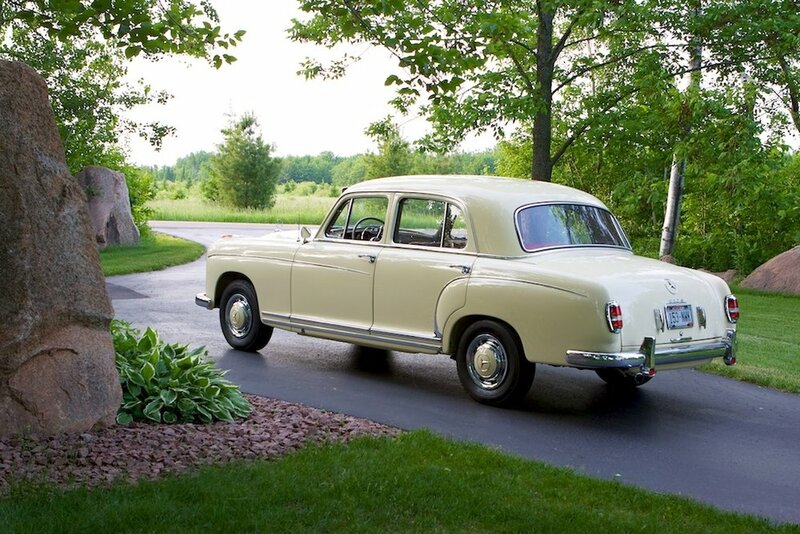 Brought the car back to the USA and sold that 220S in 1960, reluctantly - call it first love. The years flew by and in 1988 my painter in Pottstown, PA got an ivory '57 220S in the shop, owned by Bank of America, for repaint in dark green. Needless to say, I tried all and everything to buy the car but since the painter wanted to make his profit on the repaint he was not helpful. 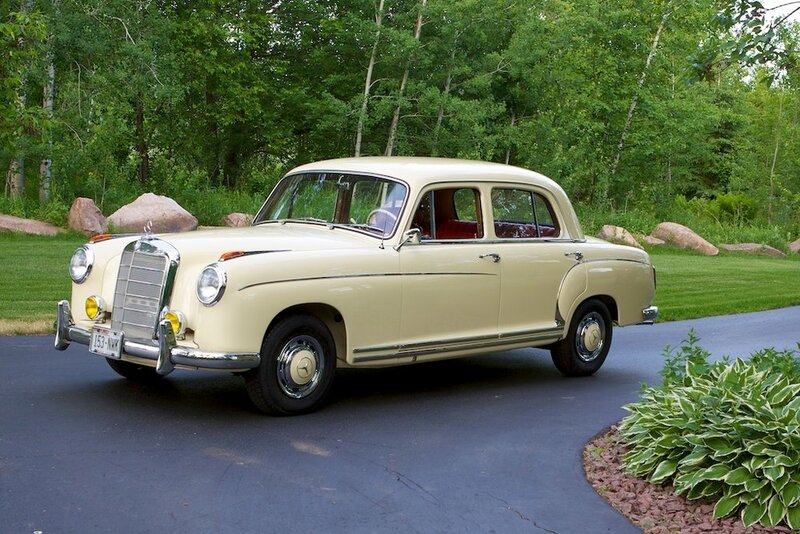 Ten years flew by and I found an estate sale auction in Minnesota where a 1957 220S was offered. So my wife, Ruth and I got in the Suburban and with trailer in tow got going. The end of the venture, we bought the 220S. Looking at it I could not help but feel 'you have seen this car before'. 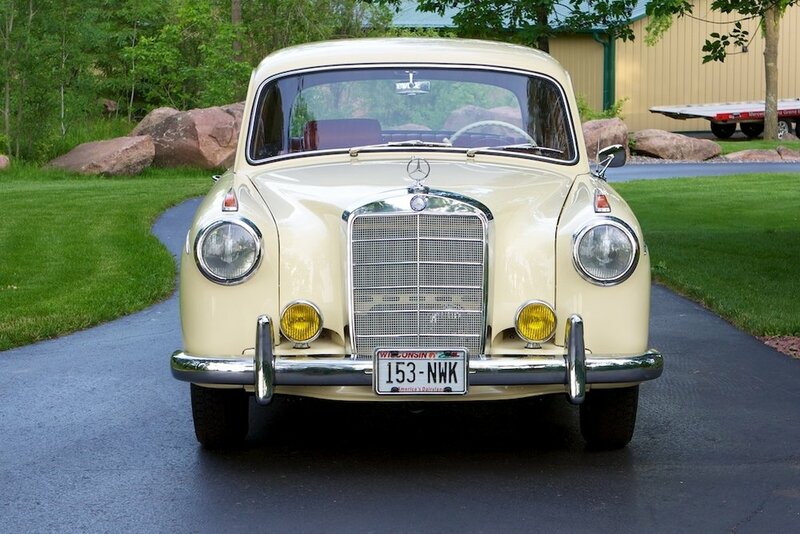 We trailored the Mercedes back home and checked the paint code label - it was the ivory color. On further inspection the color change was confirmed. Now what to do? it did not take long and the decision became clear - back to the original color and total restoration. The car got disassembled, engine out, front and rear axle out, fuel tank out, all lines underneath, fenders off. Everything got carefully sand blasted, undercarriage sprayed with bed-liner and painted ivory. Doors, trunk-lid and hood all received the same careful treatment. The body was taken down in all parts to have metal sandblasted and painted in ivory. The doors, for instance, were painted inside, outside, all over to show condition. Window mechanism cad-plated gold. 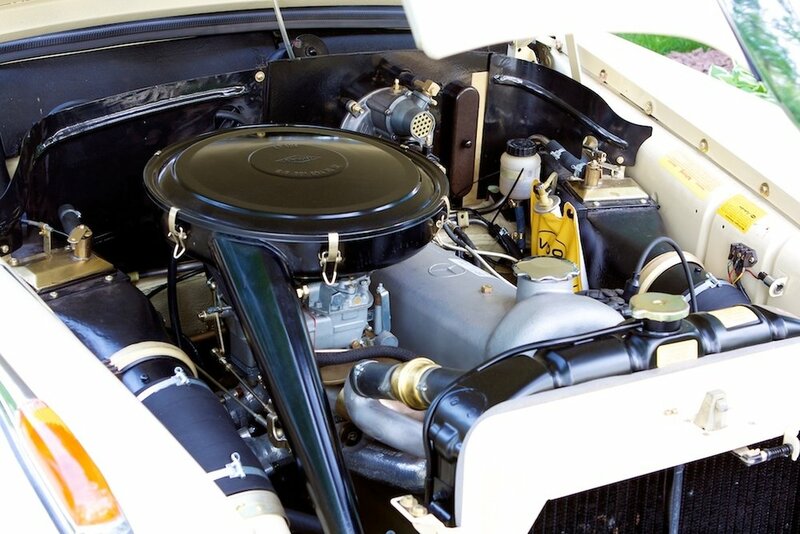 Mechanical overhaul included fuel tank and radiator service and painted "show". 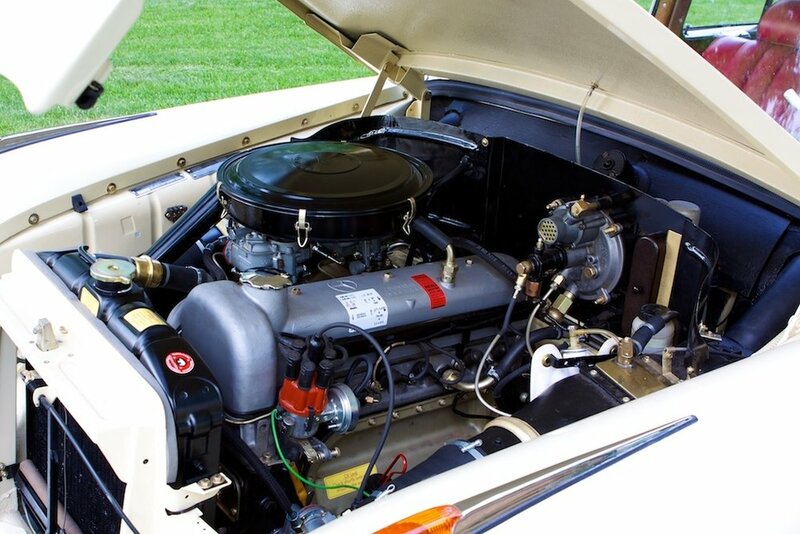 Engine rebuild with new two-barrel carb, starter, water pump, generator, belts, all metal lines cad-plated, new hoses, correct clamps, engine and transmission mounts. Complete front axle and rear axle rebuild. New rims and new hub caps along iwth Michelin tires. Car interior had very good red leather so it got resprayed in red MB leather dye, new headliner, new carpeting and floor mats. Bumpers were plated but some of the side molding trim were replated and replaced. New headights - this time the original German version, new trunk lock, door handles restored, new original radio and speakers with antenna. And then the endless list of small details, not to forget all the rubber parts - yes, all door, trunk, window seals and heater hoses. The trunk stores two spare tires; one Michelin spare and one original METZLER w/w 6.70 X 13, "1956"!